This war was like no other. It was the uprising of the Caxcanes natives. Led by Tenamaxtli who fought the Spaniards because the Spaniards were using the natives as slaves (Even though they didn't consider them slaves because they were considered "free" even though they weren't being paid and it was against their will through the econmienda system.). They destroyed everything that the Spaniards built especially stuff that was religious. Guadalajara was supposed to be in Nochistlan (3rd one named Guadalajara at the time. The one that exist in Jalisco is the fourth one) but Tenamaxtli attacked the Spaniards who were living there. The Spanish forces went back afterwards with more soldiers and finally got the Caxcanes to surrender. They renamed Tenamaxtli to Francisco Tenamaxtli because they couldn't pronounce his name. If this war was successful, the natives could've destroy the existence of the Spaniards living in Mexico and things would've returned to the way things were before the coming of the Spaniards. Writing this to Chale for her enjoyment of the information of our ancestors. Knowledge should be shared, not horded. Many of you who have read this book, probably have never heard of the Mixton War, or the hero Tenamaxtli. In addition, many of you probably believe the writer Gary Jennings. Many of you who have read the book probably believe the writer Gary Jennings. Garry Jennings is a scholar who writes his book based on facts drawn by research but this book is different because most of the information consists of mostly fabrications. I have read the book and I disagree. Tenamaxtli in the book is part Azteca (his mom is from Aztlan) and part Mexica. In real life, he's Caxcane. I think he got the idea of making Tenamaxtli Mexica/Azteca from padre Antonio Tello's book "Crónica miscelánea" which states "los pueblos de caxcanes son gente que habla casi la lengua mexicana y se precian de descender de los mexicanos [...] pero no hablan la lengua mexicana tan culta y limada como ellos." For those who do not know, during this time, la lengua mexicana refers to Nahuatl and mexicanos is referring to the Mexica. It would not but until the 1800's until la lengua mexicana will be known as Nahuatl and until mexicanos refers to everyone living in Mexico. Before then, someone who spoke the dialect of classical Nahuatl was considering a true Mexican. In the book, Guadalajara was at its present time place at the time of the Mixton war. This is not true. If you know anything about Guadalajara history, you would know that the present time Guadalajara is the fourth time the Spanish established it in Mexico. The Mixton War was the third Guadalajara. The previous ones were destroyed because of native uprising. Main reason why the fourth establishment had natives in the city to make sure that there wasn't an up rise. It's the reason why today Guadalajara still exists. It was established in February 14, 1542. In the book, Tenamaxtli leads Azteca, Yaqui, Chichimeca, and Mestizos. In real life, he led mostly Caxcanes and other indigenous people of Jalisco. The Chichimeca war started in 1550. Nine years after the Mixton War. In this war, the Chichimeca stole stuff from the Spanish like in the book. The only book about this war is: North America's First Frontier War. The Chichimeca war took place mostly in Zacatecas, Aguascalientes, and Guanajauto than in Jalisco. Also, the Spaniards used the term Chichimeca on all nomadic tribes, which consist of Caxcane, Tecuexe, Guachichile, Guamare, Pame, and Zacateco. Also in the book, Tenamaxtli died in Mexico when in reality no one knows where he died. The last time anyone ever heard of him was he was taken captive and taken to Spain. From there, no one knows what happened to him. There is stuff in real life that isn’t even discussed in the book. The war started in Mixton, Nochistlan. They do not talk about Guaxicar. He helped Tenamaxtli lead the natives of Jalisco. There is even a book about them; Tenamaxtli y Guaxicar: las raíces profundas de la Rebelión de Nueva Galicia. The book isn't close to the truth. The closes it is at is only the names and the events. On April 20, the Mixton war began in New Galicia. On June 24, Pedro de Alvarado is killed at Nochistlan, in New Galicia. On September 28, the Indigenous in New Galicia attack the town of Guadalajara, but are repulsed. In December, Coronado falls from his horse and is seriously injured. This is what I have so far on my translation of a document on Tenamaxtli. On this caxcana land it was so tied to the conquest of the aboriginal towns by the Spaniards, it is an obligation on giving reference to the Mixton War and the protector of the indigenous rebellion, Francisco Tenamaxtli. Then out comes the question of why Francisco, the answer is that when Tenamaxtli distinguish himself as a warrior he was already baptized and pertained to the economy of Miguel of Ibarra, encomendero of Nochistlan. En esta tierra caxcana tan ligada a la conquista de los pueblos abor?genes por parte de los espa?oles, se hace obligatorio dar referencia de la batalla del Mixt?n y del caudillo de la rebeli?n ind?gena Francisco Tenamaxtli. Salta la pregunta por qu? lo de Francisco, la respuesta es que cuando Tenamaxtli se distingui? como guerrero ya hab?a sido bautizado y pertenec?a a la encomienda de Miguel de Ibarra, encomendero de Nochistl?n. The Spaniards came to this land on 1530 and they went receiving peace, from the senor of Juchipila, Xiuhticuhtli, Tenamaxtli of Nochistlan, Petlacatl of Jalpa and by the cacique of the Teul. The Indigenous came a couple of years ago supporting the vejaciones which was infligian by the Spaniards. 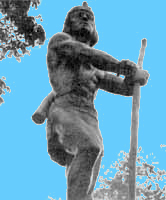 Until they were mistreated and Xiuhticuhtli traveled through the land to bring the tlatol (the word, the discourse) which cause the Indigenous to start a rebellion. Los espa?oles llegaron a estas tierras en 1530 y fueron recibidos de paz, as? por el se?or de Juchipila, Xiuhticuhtli, Tenamaxtli de Nochistl?n, Petl?catl de Jalpa y por el cacique de el Teul. Los indios vivieron algunos a?os soportando las vejaciones que les infling?an los espa?oles. Hasta que este maltrato se hizo insoportable y Xiuhticuhtli recorri? la tierra para llevar el tlatol (la palabra, el discurso), incitando a los indios a la rebeli?n. There was various clashes between the Spaniards, Caxcanes and Zacatecos. The Caxcanes and Zacatecos allied to throw out the foreigners of these lands. In Nayarit, the Coras incited jefaturados by Coringa. This happened in the year of 1541. In Jachipila which resulted the Caxcanes being victorious; and the same occurred in Nochistlan, so much that the gobernador of New Galicia requested the intervention of Pedro of Alvarado that returned prize-winning of Guatemala and feared for their cruelty between the Mexica of Tenochtitlan. For this Tenamaxtli attacked Guadalajara. Hubo varios enfrentamientos de espa?oles e indios caxcanes y zacatecos, pues estos ?ltimos se aliaron para arrojar a los extranjeros de estas tierras. En Nayarit tambi?n los coras se sublevaron jefaturados por Coringa. Esto pas? en el a?o de 1541. En Juchipila resultaron vencedores los caxcanes; y lo mismo ocurri? en Nochistl?n, tanto que el gobernador de la Nueva Galicia solicit? la intervenci?n de Pedro de Alvarado que regresaba laureado de Guatemala y hab?a sido muy temido por su crueldad entre los mexicas de Tenochtitlan. Para esto Guadalajara ya hab?a sido atacada por Tenamaxtli. Pedro de Alvarado did not hear the advice of gobernador of New Galicia for he felt that it was not time to attack Nochistlan because it was the rainy season. Alvarado argued that how was it possible that four cats made too much noise. This referred to the senors of Juchipila, Jalp, Nochistlan, and Tlaltenango, and went on that with the military of the people that he had was sufficient to put them in their place. This would cause Alvarado to encounter death in Nochistlan, he died on the 4th of July in 1541 in Guadalajara. With these clashes resulted the figure of Tenamaxtli like strategy of the war. Until, being attached of the truth, Tenamaxtli was not insatiably warlike, he was actually conciliatory, diplomatic. First he forced in the intent of fixing the things adjust to reason and justice, being supported of the natural right, now that he was obligated to defend his land, his family, and his vassals; but for the Spanish, What did they find on this foreign land, and why did they wanted to despoil them for their ownerships and reduce them al vasallaje to a senor that was across the sea? Pedro de Alvarado no prest? o?dos a los consejos del gobernador de la Nueva Galicia en el sentido de que no era oportuno en esos d?as atacar a Nochistl?n por ser temporada de lluvias. Alvarado argument? que c?mo era posible que cuatro gatillos hicieran tanto ruido. Se refer?a a los se?ores de Juchipila, Jalpa, Nochistl?n y Tlaltenango, y a?adi? que con la mitad de la gente que ?l tra?a era suficiente para aplacarlos y ponerlos en su lugar. Esta soberbia llev? a Alvarado a encontrarse con la muerte en Nochistl?n, pues muri? el 4 de julio de 1541 en Guadalajara. En estos enfrentamientos resalt? la figura de Tenamaxtli como estratega de la guerra. Aunque, apeg?ndose a la verdad, Tenamaxtli no era insaciablemente belicoso, m?s bien fue conciliador, diplom?tico. Primero se esforzaba en el intento de arreglar las cosas ajust?ndose a la raz?n y a la justicia, apoy?ndose en el derecho natural, ya que dec?a estar obligado a defender su tierra, a su familia y a sus vasallos; pero que los espa?oles ?qu? buscaban en tierras extra?as, y por qu? quer?an despojarlos de sus pertenencias y reducirlos al vasallaje de un se?or de allende el mar? It is here that it is clear that whether or not Francisco Tenamaxtli and Diego of Zacateco were the same person. There is a lot of proof that confirms that they were two distinct persons. Francisco Tenamaxtli conciliatory, always maintaining to reason and justice; lover of peace. He declared war when there was no other alternative: "Axcan quema, tehuatl nehuatl". Now, you or me. With this declaration of war they battled against the virrey Antonio de Mendoza who form an army with numerous Indigenous people, with which was more than 50 thousand Tlaxcaltecas, Mexicanos (Mexica), Purepechas, and others total. Tenamaxtli waited in the penol of Nochistlan with his Caxcanes and Zacatecos. Of course before the beginning of the battle the senor of Jalpa, Petlacatl, interviewed with the Spaniards telling them that he was there because he was afraid of Tenamaxtli; but that he did not have anything against them; they blocked the exit so that he would stop the scenario where he would stop the combat. That's how they did it, they blocked the rearguard and Petlacatl moved away to Jalpa with his two thousand warriors, where they left to discovered where they were corresponded to defend. Es aqu? donde se aclara la perplejidad de si Francisco Tenamaxtli y Diego el Zacateco eran la misma persona. Hay varias pruebas que confirman que eran dos personajes distintos. Francisco Tenamaxtli conciliador, sosteniendo siempre la raz?n y la justicia; amante de la paz. Lanzaba el grito de guerra s?lo cuando no le quedaba ya alternativa: "Axcan quema, tehuatl nehuatl". Ahora s?, t? o yo. Con este grito de guerra se dieron las batallas contra el virrey Antonio de Mendoza quien form? el ej?rcito m?s numeroso hasta entonces con los indios aliados, los cuales sumaban m?s de cincuenta mil entre tlaxcaltecas, mexicanos, pur?pechas y otros. Tenamaxtli esper? en el pe?ol de Nochistl?n con sus caxcanes y zacatecos. Por cierto que antes de comenzar la batalla el se?or de Jalpa, Petl?catl, se entrevist? con los espa?oles dici?ndoles que ?l estaba all? porque le ten?an temor a Tenamaxtli; pero que no ten?a nada contra ellos; que le cubrieran la salida para abandonar el escenario donde se llevar?a a cabo el combate. As? lo hicieron, le cubrieron la retaguardia y Petl?catl se alej? rumbo a Jalpa con sus dos mil guerreros, dejando al descubierto la parte que le correspond?a defender. Hunger, lack of water, the disadvantage in implements of war, and in the number of combatants gave the triumph to Mendoza. Afterwards the Caxcanes of the region of Juchipila and their allies that they weren?t conquered that easily, they empenolaron in the Mixton with their women and children to present the definitive battle. To her the volunteers of Jalpa responded with the permission of their senor. El hambre, la escasez de agua y la desventaja en implementos de guerra y en el n?mero de combatientes, dio el triunfo a Mendoza. Entonces los caxcanes de la regi?n de Juchipila y sus aliados que no se daban por vencidos tan f?cilmente, se empe?olaron en el Mixt?n con sus mujeres e hijos para presentar la batalla definitiva. A ella acudieron los voluntarios de Jalpa con el permiso de su se?or. Of Nochistlan, Mendoza marched to Juchipila where pernocto and organized the strategy of war. Before establishing his camp in the wilderness of Mixton, sent emissaries solicitant to the indigenous decreased to peace because the Spaniards detained Tenamaxtli. The captains of the indigenous empenolados asked to see him, sending at the same time a species of embassy to be interviewed with Miguel of Ibarra. In fact, they saw Tenamaxtli, but in a military maneuver they snatched him off the hands of the Spaniards and Tenamaxtli fled with them caused him to become the captain general of the rebellion. Mendoza went with his plan of war which he layout. Within this was to despair the indigenous for the lack of food and water. De Nochistl?n, Mendoza march? a Juchipila donde pernoct? y organiz? la estrategia de guerra. Antes de establecer su campamento en las faldas del cerro del Mixt?n, mand? emisarios solicitando a los ind?genas bajaran de paz porque con los espa?oles ven?a el caudillo Tenamaxtli en calidad de detenido. Los capitanes de los indios empe?olados pidieron verlo, mandando a su vez una especie de embajada a entrevistarse con Miguel de Ibarra. En efecto, vieron a Tenamaxtli, pero en una maniobra b?lica lo arrebataron de las manos de los espa?oles y Tenamaxtli huy? con ellos cuesta arriba convirti?ndose en capit?n general de la rebeli?n. Mendoza sigui? su plan de guerra que hab?a trazado. Dentro de ?ste estaba desesperar a los indios por falta de alimentos y agua. Something happened in Nochistlan. The Teultecas before putting the orders of Tenamaxtli, they apalabraron with the Spaniards agreeing that they would launch their arrows to the air so that they would not cause them harm. The Spaniards for their part offered to respect their lives. Y sucedi? algo semejante a lo de Nochistl?n. Los teultecas antes de ponerse a las ?rdenes de Tenamaxtli, se apalabraron con los espa?oles acordando que lanzar?an sus flechas al aire para no causarles da?o. Los espa?oles por su parte ofrecieron respetar sus vidas. The Teultecas, in the hour of the clash were obligated to abandon their trenches so that the rest of the warriors would do the same to respond in defense. Los teultecas, a la hora de la refriega abandonaron sus trincheras obligando a los dem?s guerreros hacer lo mismo para acudir en su defensa. The battle resulted favorable to the army of virrey Mendoza. Tenamaxtli fled for the mountain range accompanied by his allegados and went in the wilderness of Nayarit. Anduvo alzado nine years, maintaining combats every time it was necessary. If the Caxcana rebellion put a tremble to the conquest, the Mixton was a battle devisiva, which had not finished with it. It continued there being groups of native rebellious called Chichimecas by the Spaniards, which lived in peace even in 1590 by the participation of the racially mestizo Miguel Caldera which he proposed to appease them with other forms different than those of the Spaniards. La batalla result? favorable al ej?rcito del virrey Mendoza. Tenamaxtli huy? por la serran?a acompa?ado de sus allegados y se intern? en las sierras de Nayarit. Anduvo alzado nueve a?os, sosteniendo combates cada vez que se hac?a necesario. Porque, si bien la rebeli?n caxcana puso a temblar a la conquista, la del Mixt?n fue una batalla decisiva, aunque no todo termin? con ella. Sigui? habiendo grupos de ind?genas rebeldes llamados chichimecas por los espa?oles, los cuales se pacificaron hasta en 1590 por la participaci?n del mestizo Miguel Caldera que se propuso apaciguarlos con otras formas diferentes a las de los espa?oles. Tenamaxtli decided to return to the frailes franciscanos, which they took him to the bishop of Guadalajara Pedro Gomez de Maraver. And this it conducted it at the same time to Mexico City with the second virrey of New Spain don Luis of Velasco, with the hope of which he would be forgiven because the fight was just. Nevertheless, the decision of the virrey of Velasco was not in favor of Tenamaxtli and was deported to Valladolid, Spain in 1552. In Valladolid he continued his fight, but now instead of using arrows he used reason and the ideas in defense of justice and liberty. Tenamaxtli decidi? entregarse a los frailes franciscanos, quienes lo llevaron con el obispo de Guadalajara Pedro G?mez de Maraver. Y ?ste lo condujo a su vez a la ciudad de M?xico con el segundo virrey de la Nueva Espa?a don Luis de Velasco, con la esperanza de que fuera perdonado porque su lucha era justa. Sin embargo, la decisi?n del virrey de Velasco no favoreci? a Tenamaxtli y fue deportado a Valladolid, Espa?a en 1552. En Valladolid continu? su lucha, pero ahora en vez de flechas us? la raz?n y las ideas en defensa de la justicia y la libertad. Luck occurred in Valladolid when he met with fray Bartolome of the Casas, tireless defender of the Indigenous against the Spaniards in the bishopric of Chiapas. Of the Casas he became his counselor and translator in the summing-ups that Tenamaxtli presented to the Consejo of Indies and the king of Spain, in which among others many things he just asked that they returned him to his land to recover what was his. Toc? en suerte en Valladolid encontrarse con fray Bartolom? de las Casas, incansable defensor de los indios contra los espa?oles en su obispado de Chiapas. De las Casas se convirti? en su consejero y traductor en sus alegatos que Tenamaxtli presentaba al Consejo de Indias y al rey de Espa?a, en los que entre otras muchas cosas justas ped?a se le retornara a su tierra para recobrar lo que era suyo. He did not achieve anything because there is record of him to 1556. The name of Francisco Tenamaxtli after this year is lost. The only thing that is sure is that he never returned to New Spain, therefore if he did the cronistas would have written something about him. No logr? nada porque de ?l se tienen noticias s?lo hasta 1556. El nombre de Francisco Tenamaxtli despu?s de ese a?o se pierde. Lo m?s seguro es que nunca volvi? a la Nueva Espa?a, pues de haberlo hecho los cronistas hubieran dejado escritos que hablaran de ?l. "Don Francisco Tenamaxtli, cacique or tatoan (tlahtoani or gobernante) of the province of Nochiztlan and Jalisco? I have been sent to this kingdom of Castilla?preso and banished, alone, dispossessed from my state and senorio and from my wife and children, with poverty, thirst, and hunger and extreme need by sea and by land, suffering many offenses and insults and pursuits? The Spaniards have not stop doing what they did to me and so many and not credible by man of the world, irreparable damages, doing me injust wars, cruelty, killing me in them many of my vassals and to my relatives and deudos? The beginning of this damages and wrongs received was from a don Nuno of Guzman that first came to my land, for I was senor of these lands, not recognizing to another senor in the world by superior? Because I, he told don Francisco, didn?t want but to leave of peace, sending my people to receive the Spaniards? The injustices and cruelties of Juan of Onate and Cristobal of Onate and of Miguel of Ibarra which made captains committed in that kingdom, it could not be seen nor thought. They hung nine principles because by the vajaciones and scourges and sticks, and other diverse evil and cruelty and no sufribles bad treatments that so much impiety and wickedness, hu?anse to the mounts? And I, he told don Francisco, seeing that much inhumanity, to the nine caciques together, without justice, hallandolos in their houses and safe land, habian ahoracado, and many and innumerable from my vasallos perish, no quedando dellos from all the neighbors of that kingdom one of a hundred parts, there was no justice nor remedio de haberla? I remember also listening to the people who good cared of me, to save them and me? because if I didn?t hear, with the same injustice and cruelty, fuera ahoracado. Y yo, el dicho don Francisco, viendo que tan inhumanamente, a los nueve caciques juntos, sin justicia, hall?ndolos en sus casas y tierras seguros, hab?an ahorcado, y muchos e inumerables de mis vasallos hab?an perecido, no quedando dellos de todos los vecinos de aquel reino una de ciento partes, no habiendo justicia ni remedio de haberla...acord? tambi?n huir con la poca gente que me quedaba, por salvar a ellos y a m?...porque si no huyera yo tambi?n, con la misma injusticia y crueldad, fuera ahorcado. This flee, and this natural defense, very powerful senors, call and have been called always the Spaniards, mistreating of the property of the words, in all the Indies, against the King to be raised". Este huir, y esta natural defensa, muy poderosos se?ores, llaman y han llamado siempre los espa?oles, usando mal de la propiedad de los vocablos, en todas las Indias, contra el Rey levantarse". Tenamaxtle, or correctly Tenamaxtli or Tenamatzin, means according to fray Alonso of Molina: "stones which are put in a girded to be heated by the fire". Miguel Leon Portilla says: "For him to adopt for a name or title of a principal senor, could be done in metaphorical sense, as soon as support or backup of the town, since with the said stones which formed in which the living of the community was prepared". Tenamaxtli, or correctly Tenamaxtli or Tenamatzin, signifies according to fray Alonso of Molina: "stones on that put the pot al fire". And Miguel Lion Porthole says us: "Al to be adopted like name or title of a main gentleman, could be done in metaphorical sense, as soon as support or backup of the town, since with the said stones the hearth was formed in which the living of the community was prepared". Tenamaxtli, o correctamente Tenamaxtli o Tenamatzin, significa seg?n fray Alonso de Molina: "piedras sobre que ponen la olla al fuego". Y Miguel Le?n Portilla nos dice: "Al adoptarse como nombre o t?tulo de un se?or principal, pudo hacerse en sentido metaf?rico, en cuanto apoyo o soporte del pueblo, ya que con las dichas piedras se formaba el fog?n en el que se preparaba el sustento de la comunidad". "Tenamaztle became strong in the mounts or penoles to escape from being hung like so many others, tired of the infamies that he was against the crimes committed by the encomederos and soldiers. It was his natural defense which, like as with certainty expression says, "they call and have called always the Spaniards? against the King to be raised"
"Se hab?a hecho fuerte Tenamaztle en los montes o pe?oles para escapar de ser ahorcado como tambi?n lo hicieron otros, hartos de las infamias que en su contra comet?an encomenderos y soldados. Era su natural defensa que, como con certeza expresi?n lo dice, "han llamado siempre los espa?oles...contra el Rey levantarse". This was the Francisco Tenamaztle, of which much was a great deal was spoken in his time, falling at times in errors and confusions. As we have seen, the ones that knew him personally and he himself do not leave in reality doubts about of his identity: it was him who fought like the senor of Nochistlan; sought from time to time the peace; rejected, continued his fight for nine year until the end opted for being delivered the friars that caused the arrival of bishop G?mez De Maraver. Deported to Spain, he found there, in Valladolid with fray Bartolome. Helped for this, undertook a new form of form of battle in defense of the rights of his pueblo and in search of his liberty. Este era el Francisco Tenamaztle, del que mucho se habl? en su tiempo, cayendo a veces en errores y confusiones. Como hemos visto, los que lo conocieron personalmente y ?l mismo no dejan en realidad duda acerca de su identidad: fue ?l quien combati? como se?or de Nochistl?n; busc? en ocasiones la paz; rechazado, continu? su lucha por nueve a?os hasta que al fin opt? por entregarse a los frailes que lo hicieron llegar al obispo G?mez De Maraver. Deportado a Espa?a, se encontr? all?, en Valladolid con fray Bartolom?. Ayudado por ?ste, emprendi? entonces una nueva forma de combate en defensa de los derechos de su pueblo y en busca de su libertad". This page has the name of the political chief native that command an important contingent of natives to put up a fight to the presence of the Spaniards in the West of Mexico, dedicated all his pledge in avoiding the presence of the conquerors and with it the oppression and spoils of his town. Coaxican (or Guaxícar as he is also known) and his settlement Xochitepec (present day Magdalene, Jalisco, Mexico) were probably tax subjects of the leaders of Etzatlán before the hispanic presence in the area. Esta pagina lleva el nombre de jefe político indígena que al mando de un importante contingente de indígenas opuso resistencia a la presencia de los españoles en el Occidente de México, dedicó todo su empeño en evitar la presencia de los conquistadores y con ello la opresión y despojo de su pueblo. Coaxican (o Guaxícar como tambien se le conoce) y su asentamiento Xochitepec (actual Magdalena Jalisco, Mex.) fueron probablemente sujetos tributarios de los jefes de Etzatlán antes de la presencia hispánica en el área. Once consummate the conquest of the kingdom of New Spain, in August 13, 1521, the Spaniards were given the task to explore and to establish its control in all the territory. In 1535, the Spaniards arrived from the East to the zone among the Volcano of Tequila and Ahuacatlán, in search of slaves. Since the first entering of Nuño de Guzmán, the native of new Galicia declared their discomfort and inconformidad with verify liftings, not alone by the treatment the conqueror had toward them, but also by their own character of implacable. Una vez consumada la conquista del Reyno de la Nueva España, el 13 de agosto de 1521, los españoles se dieron a la tarea de explorar y establecer su dominio en todo el territorio. En 1535, los españoles llegaron desde Oriente a la zona entre el Volcán de Tequila y Ahuacatlán, en una incursión en busca de esclavos. Desde las primeras incursiones de Nuño de Guzmán, los indígenas de Nueva Galicia manifestaron su malestar e inconformidad con constates levantamientos, no solo por el trato del conquistador hacia ellos, sino también por su propio carácter de irreductibles. During the decade of 1530 - 1540 a religious reviving form of movement among the natives started to rise. In 1541 the rebellion was of the natives, that it reached such magnitude that not only did it danger Spanish control in New Galicia but perhaps all of New Spain. Durante la década de 1530 - 1540 existió de manera clara una forma de movimiento renovador religioso entre los nativos. En 1541 se dio la rebelión abierta por parte de los indígenas, alcanzado tal magnitud que no solo puso en peligro el dominio español en Nueva Galicia sino quizás en toda la Nueva España. When began the rebellion of new Galicia, Guaxicar, became one of its main leaders, extending its influence beyond Ahuacatlán, in the West, and to the Valley of Atemajac, in the east. But the nuclear zone under its control went the north margin of the Gap of Mary magdalene, the northwestern sections of the Volcano of Tequila, and an enormous area inside the vast territory of barrancas and mountains, in the north. This zone appears indicated in the two earliest maps than herself know of new Galicia, the Map of Compostela (1542) and the Map of Ortelius (1579); appearing in this I finalize with the name of "Guaxacate cus province montosa". Cuando empezó la rebelión de Nueva Galicia, Guaxicar, se convirtió en uno de sus principales dirigentes, extendiendo su influencia más allá de Ahuacatlán, en el occidente, y hasta el Valle de Atemajac, en el oriente. Pero la zona nuclear bajo su dominio fue la margen norte de la Laguna de Magdalena, las secciones noroccidentales del Volcán de Tequila, y una enorme área dentro del vasto territorio de barrancas y montañas, en el norte. Esta zona aparece indicada en los dos mapas más tempranos que se conocen de Nueva Galicia, el Mapa de Compostela (1542) y el Mapa de Ortelius (1579); apareciendo en este ultimo con el nombre de "Guaxacate cus provincia montosa". Once they were defeated them raised cazcanes in the second battles of the Mixtón in 1541, Guxicar and its western allies in the rebellion were found exposed to all the force of the I exercise of the Virrey Antonio of Mendoza, who defeated to the allied towns that they remained in 1542. While Xochitepec was occupied for the Spaniards, Guaxicar and their I exercise they escaped al abrupt territory al north of the Large River of Santiago. Guaxicar never was learned for the Spaniards, neither was neither yielded. In fact, its lasting resistance, probably, marks the intial phases of the great second phase of the rebellion, call "the war of the nayaritas". Although the Spaniards declared the Rebellion of new Galicia, concluded in 1542, in reality this lasted, in its second phase, to 1722; in this year was captured and destroyed the important central ritual and palace known as Tonati, located in the Table of the Nayar which had become the symbol and focus of the resistance al colonial order. The possible inheritance of Guaxícar in the zone this indicated of several way, as for example in the topónimos, as that of Guaxícori. Una vez que fueron derrotados los alzados cazcanes en la segunda batalla del Mixtón en 1541, Guxicar y sus aliados occidentales en la rebelión se encontraron expuestos a toda la fuerza del ejercito del Virrey Antonio de Mendoza, quien derrotó a los pueblos aliados que quedaban en 1542. Mientras que Xochitepec fue ocupada por los españoles, Guaxicar y su ejercito escaparon al abrupto territorio al norte del Río Grande de Santiago. Guaxicar nunca fue aprendido por los españoles, ni tampoco se rindió. De hecho, su resistencia duradera, probablemente, marca las etapas iniciales de la segunda gran fase de la rebelión, llamada "la guerra de los nayaritas". Aunque los españoles declararon la Rebelión de Nueva Galicia, concluida en 1542, en realidad ésta duró, en su segunda etapa, hasta 1722; en este año fue capturado y destruido el importante centro ceremonial y palacio conocido como Tonati, localizado en la Mesa del Nayar el cual se había convertido en el símbolo y foco de la resistencia al orden colonial. La posible herencia de Guaxícar en la zona esta indicada de varias manera, como por ejemplo en los topónimos, como el de Guaxícori. Before the Spaniards captured and they will relocate to the population of Xochitepec, the capital of Guaxicar, is known that the settlement itself was not found in same place that the present town of Mary magdalene. When the virrey Antonio of Mendoza enter Xochitepec, this had more than three thousand inhabitants, what owed if there is been so alone a fraction of its original population. The demographic descent would have been caused, mainly, by the war, by the flight of the refugees of the rebellion and by it accelerated epidemic caused by the Europeans. Antes de que los españoles capturaran y reubicarán a la población de Xochitepec, la capital de Guaxicar, se sabe que el asentamiento no se encontraba en mismo sitio que el actual pueblo de Magdalena. Cuando el virrey Antonio de Mendoza entro en Xochitepec, ésta tenía más de tres mil habitantes, lo que debió de haber sido tan solo un fracción de su población original. El descenso demográfico habría sido causado, principalmente, por la guerra, por la huida de los refugiados de la rebelión y por la acelerada epidemia ocasionada por los europeos. In the Plaza of Weapons of Magdalene a bust is found of Guaxícar, and although nobody knows for sure how he was physically, this is a tribute to one of the most heroic personages of the area. It is pathetic how little remains of the architecture postclassic of Xochitepec, but the little that remains still can be preserved for the future, which would be a good tribute for all the heirs of Guaxicar. En la Plaza de Armas de Magdalena se encuentra un busto de Guaxícar, y aunque nadie sabe con seguridad cómo era físicamente, éste es un tributo a uno de los personajes más heroicos del área. Es patético lo poco que queda de la arquitectura postclasica de Xochitepec, pero lo poco que queda todavía puede preservarse para el futuro, lo cual sería un buen tributo para todos los herederos de Guaxicar.